Definition at line 152808 of file Cxx_Grammar.h. This pointer a SgBasicBlock, and holds the statements in the "true" body of if statement. This pointer a SgBasicBlock, and holds the statements in the "false" body of if statement. Returns pointer to copy of SgIfStmt. Access function for p_else_numeric_label (Fortran only). lable used for end of if statement (Fortran only). 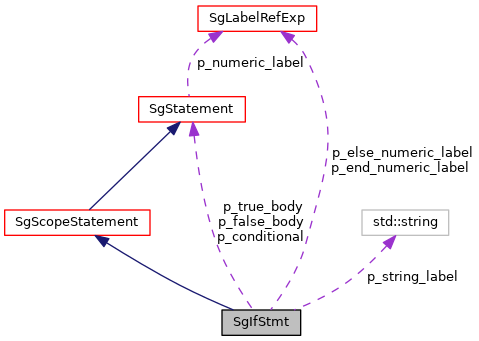 Access function for p_string_label (Fortran only; string required to addess generality of Fortran numeric and named labels). label used for Fortran only. Access function for p_end_numeric_label (Fortran only). Fortran specific function to indicate if the Fortran "if" statement has an "end" construct (C/C++ useage always returns false). value to use in setting associated (Fortran specific) data member. Fortran specific function to indicate if the Fortran "if" statement uses the "then" construct (C/C++ useage always returns false). Fortran specific function to indicate "else if" form of "if" construct (C/C++ useage always returns false). Cast function (from derived class to SgIfStmt pointer). This functions returns a SgIfStmt pointer for any input of a pointer to an object derived from a SgIfStmt. Returns valid pointer to SgIfStmt if input is derived from a SgLocatedNode.